(339/13) 230 Jones Street; Musicians Union Hall. 3B stories; reinforced concrete and brick structure; brick and terra cotta facade, second level arches with musical symbols, terra cotta keystones and belt courses, galvanized iron cornice; two-part commercial composition; English Georgian ornamentation; vestibule: terra cotta entry frame, cornice moldings in vestibule; storefronts: green marble bulkheads; signs: “Musician’s Union” over door; alterations: security gates, storefronts mostly remodeled, damage to cornice. Original owner: Local No. Six, American Federation of Musicians. Architect: Sylvain Schnaittacher. 1924. 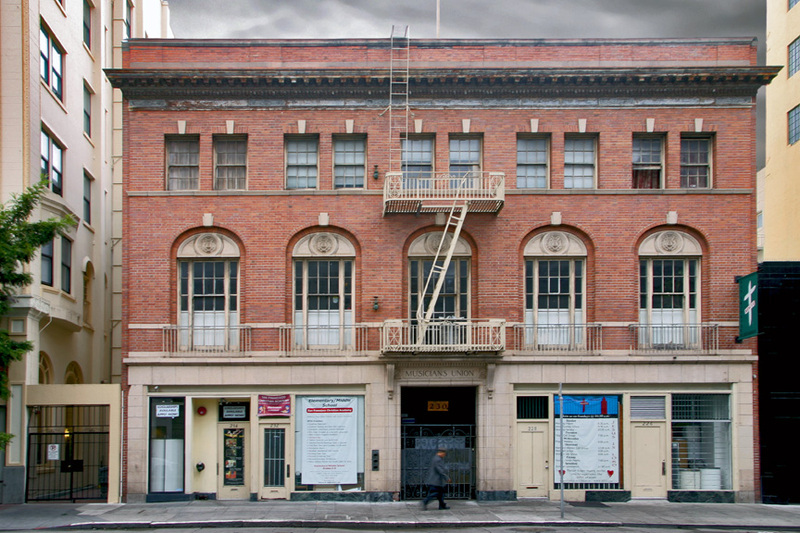 Sylvain Schnaittacher was president of the San Francisco Chapter of the American Institute of Architects when he designed the Musicians Union Hall. The pomp and pageantry that surrounded the building’s official opening on 09 June 1925 included a dedication by Mayor James Rolph, Jr. and a morning parade down Market Street with six huge brass bands and fifty automobiles full of civic and trade union leaders. Celebrations went on for five days, highlighted by dress balls, lavish dinners, and concerts at the beautifully appointed new union hall. The handsome new building is a steel brick concrete structure of four floors, the basement being a ten foot ceiling composed of fifty-five hundred square feet which will later be made into recreation rooms and club rooms; it also contains the engine room and vaults for records. The main floor consists of a foyer, cigar stand, elevator, beautiful meeting room and combination ball room. Members will use the hall to transact business during the day and at night this beautiful hall will be rented for balls, banquets or recitals. This hall also opens on the mezzanine floor, and both may be used as a unit, together with the ladies’ room, as well as the gentlemen’s room in the basement. The main floor also has two beautiful stores which will be rented to desirable enterprises. The foyer on the main floor is equipped with hat rooms, telephone exchange and five sound-proof telephone booths and drinking fountain. The mezzanine floor contains a small hall, offices of the Musicians’ Union and the other offices will be occupied by the Stage Hands’ Union. In the early ’70s I was somewhat of a regular at Ginger’s, a little hole-in-the-wall at 125 Mason Street with a beautiful, old-fashioned, redwood brass-rail bar that contrasted starkly with beat-up wooden tables and chairs, and an ancient parlor upright piano near the back, next to the jukebox. The place was a dive, which was reason enough for me to like it, but what enthralled me was that most nights the music came from the battered, old piano; brought to glorious life by an elder black man whose eclectic medleys ranged from ragtime to swing to rhythm-and-blues. I never failed to put something in his tip jar and frequently expressed my appreciation for his musicianship. He was kind enough to sometimes sit and talk with me during breaks, and in the course of our conversations I learned, among other things, that he belonged to Local No. Six. 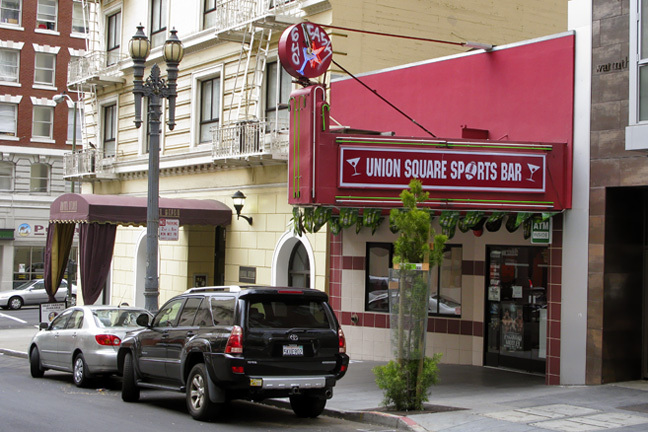 Those were the days when the union’s San Francisco membership was at its peak, having reached an all-time high of 5,900 in 1969, and many of its members stayed alive by playing in Tenderloin bars and nightclubs. 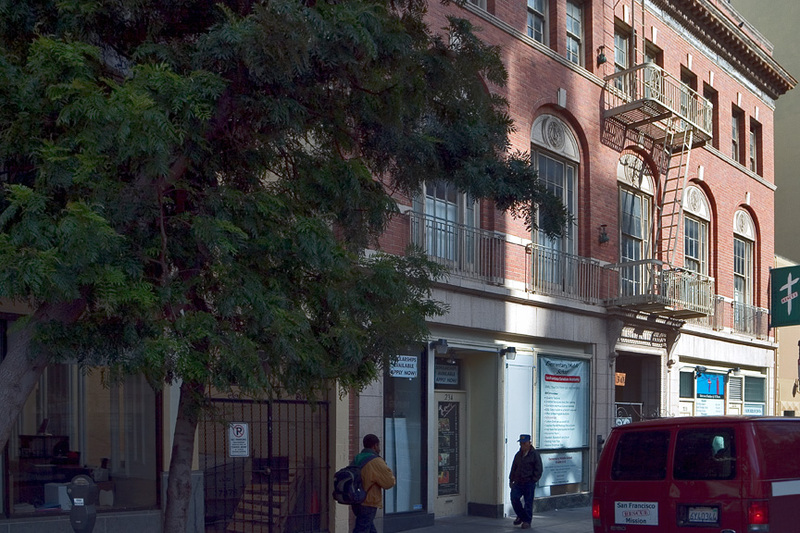 When the Musicians Union moved to its current headquarters on Ninth Street in 1998, the Jones Street hall was taken over by the San Francisco Rescue Mission, who infamously loaded the union’s basement archives into dumpsters and hauled them away, turning priceless artifacts of San Francisco’s musical history into landfill. The loss is overwhelming and tragically irreversible. 1. King, Clarence H., Secretary-Treasurer, Local No. 6. Progressive History of Local No. Six, American Federation of Musicians. San Francisco. 1925.